If you’re a touring musician, it’s likely gigs are the lifeblood of your business. The AudioTheme Gigs module allows you to manage and share the details of those gigs: dates, times, venues, ticket pricing, tour information, and a brief description. The Gigs → All Gigs screen provides an overview of your current and past gigs. 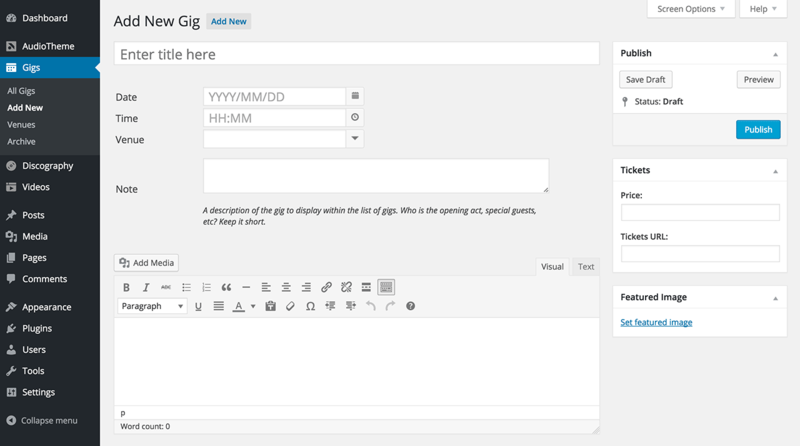 You can even save potential gigs as drafts and publish them at a later date. So you just booked a new gig; share the details with your fans using the Gigs → Add New screen. Oh, and congrats on the new gig! Any time you add a new venue in AudioTheme, you’ll be asked to select a time zone. Time zones are represented by cities within them, so it may be necessary to search the list for the city closest to a venue. Time zones are important so time calculations can be performed and fans in other regions can subscribe to your gigs, especially for tours that span multiple states or even countries. To add or edit additional venue information, see Gigs → Venues. 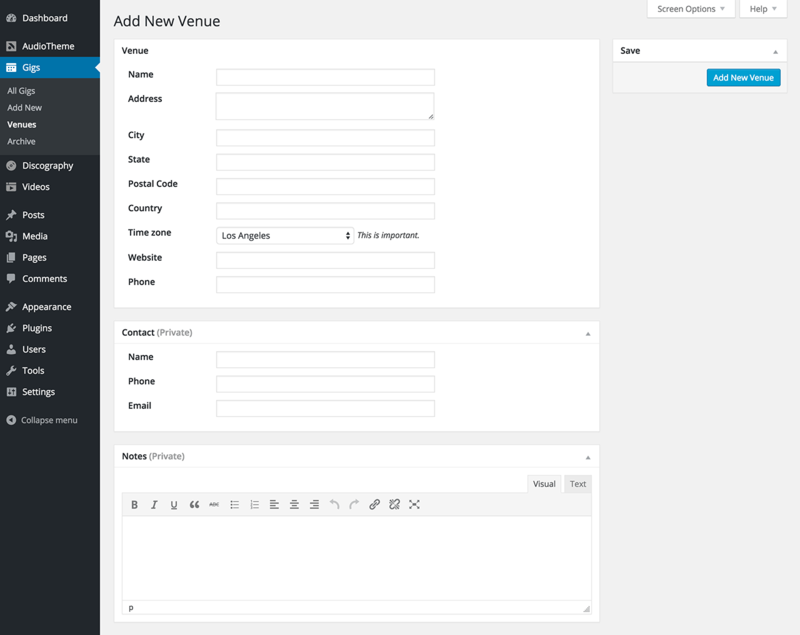 Tip: Try adding venues on the “Add New Venue” screen before they’re needed when adding a gig. After you type the venue’s city, a dropdown should appear that will help auto-complete the time zone. Does it cost money to attend your gig? Share that here so there aren’t any surprises. If tickets can be purchased online, link it up. Featured Image – If the author of your theme built in support for featured images, you can set those here. Find out more about setting featured images in the WordPress Codex. When you’re done adding a gig, press the Publish button to make it available on your site. If you’re not ready to publish, or want to finish updating your gig later, press the Save Draft to privately save your progress. You can access your drafts at a later time through the Gigs → All Gigs screen. The Gigs → Venues screen displays an overview of your venues. Think of it as a database or address book for all the venues where you have performed, will perform, or may potentially perform in the future. To learn more about the Archive option, view Archive Setup.